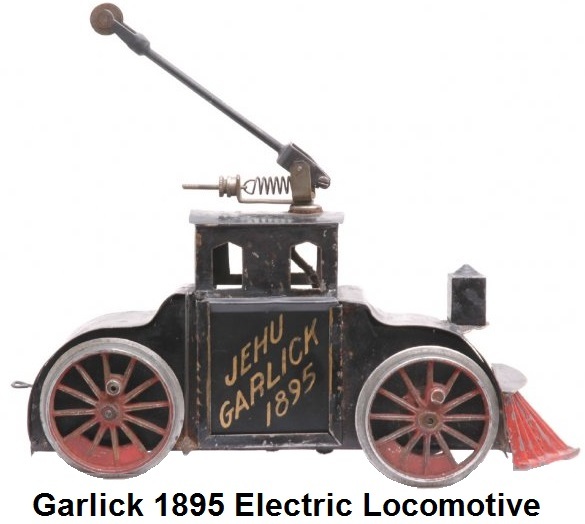 The Jehu Garlick 1895 electric locomotive is the oldest surviving example of tinplate electric toy trains produced in the United States of America. It was built in 1895 by Jehu Garlick and his associate, Harry Hathaway in Paterson, New Jersey. It is a 4 wheeled steeple cab type locomotive built to resemble the Baltimore and Ohio RR LE-1 Electric Tunnel train locomotive prototype which was put in service and began running around the same time. Starting dates for American manufacturers of electric toy trains that have been located and collected began with Jehu Garlick's Electric Tunnel Locomotives in 1895, then Carlisle & Finch's number one small brass trolleys in September of 1896, followed by Lionel's 2⅞ inch gauge trains in 1901 (also a B&0 tunnel locomotive) and finally Knapp's 2" gauge in 1902 (marketed as the Kenco Trade Mark No. 1 Electric Trolley Train kit). Carlisle & Finch is often credited with being the actual inventors of the electric toy train since they were the first American company to produce electrically powered miniature trains in large volumes. Jehu Garlick was born in New Jersey in 1865 of parents who had emigrated from England. He is most notably known as an associate of Eugene Beggs of Patterson New Jersey, who began manufacturing live-steam driven toy trains in 1871. In 1889 Garlick went out on his own to make steam driven trains that were practically identical to Beggs in appearance, but included several improvements in the working mechanisms. Garlick had obtained a patent in 1888 for a reverse cluster and employed it on his steam locomotives. His small shop was located behind his home at 20 12th Avenue in Paterson. In addition to building the steam driven toy trains, Garlick performed bicycle repairs. 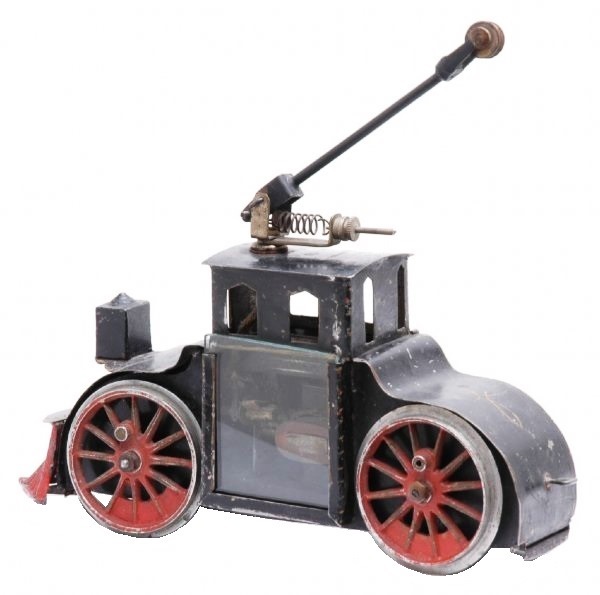 Influenced and inspired by the main line operation of the new and revolutionary electric powered B&O Tunnel Train, in 1895 Garlick and his helper, Harry Hathaway, decided to produce an electric powered toy train locomotive. Hathaway was very familliar with the fundamentals of electricity. Like Begg's steam driven trains, Garlick's steam locomotives were designed to run on a circle of track. The locomotive's wheels were fixed radially in order to reduce resistance. Garlick adopted the same design for the electric locomotive. While the prototype employed two trucks with four wheels each and a half cab with a sloping front riding on each truck, forming two units coupled permanently, the Garlick model was a straight four wheel locomotive with one pair of driving wheels. The same pattern used for casting the steam driven locomotive wheels was utilized for the electric loco. This configuration required the use of counterbalance weights and crack pin bosses. The wheels were 2" diameter and were made of aluminum, which was considered a rare metal during this period. The wheels were set five inches apart, center to center to run on a 1⅞" gauge 2 rail track. The train's body was made of tinplate. The locomotive was designed to be battery operated. Hathaway built the electric motor. It was simplistic, employing a permanent 'U' shaped magnet placed vertically on the floor of the loco with its armature revolving horizontally so that the shaft was parallel with the center of the loco. The armature consisted of 4 handwound magnets with coils that terminated in a 4 segment commutator, attached to the single shaft. The shaft extended to the rear of the loco and was fitted with a single threadworm gear. The loco was driven when the threadworm gear meshed with a spur gear mounted on the rear wheel axle. The motor brushes were made of thin copper strips mounted in brass posts. The loco was fitted with a trolley pole similar to those used on street cars. The pole drew positive direct current from an overhead wire, while the body of the car was grounded through the wheels and track to the negative side of the power source, which was a six volt battery. The locomotive could be reversed by changing the polarity of the power leads. The fixed worm-gear drive, meant that the engine could not be moved unless the motor was running. Adding a double or triple thread worm gear would have added significant costs, so Garlick used the single thread worm gear. The same type of pilot and headlight installed on the Garlick steam driven models was used. A unique feature of the Garlick loco was a removable glass window located on the side of the cab that provided a view of the electrical motor and spinning armature. Working electric motors were considered quite a novelty during that time. Garlick and Hathaway produced two hundred of these electric driven locomotives. However, they sold poorly, and it was decided to not continue manufacturing the loco. Garlick continued to build toy steam driven locomotives until the turn of the century when the advent of that new toy, the automobile, attracted his attention and he became the first agent for horseless carriages in his native city of Paterson. Garlick died May 8, 1944, at the age of 80. His assistant Harry Hathaway, who provided most of the detailed information concerning the electric locomotives, was known as the best electrician in town. Hathaway later went into the retail photographic business, which he managed until his death in January 1946. The loco shown here is the only known surviving example of the Jehu Garlick 1895 electric loco. Its history has been traced back to the original owner, Harry Hathaway - Garlick's partner. The Garlick was later purchased by noted train collector and author Walter Lucas from Harry Hathaway. There is a label on the bottom of the loco which documents this transaction between Hathaway and Lucas. 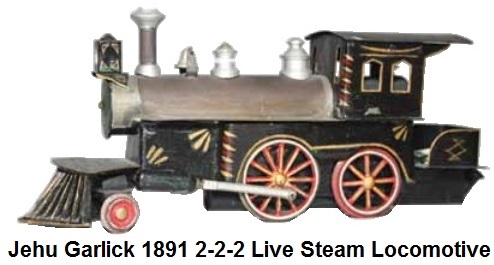 Noted collector Larry House acquired this Garlick loco in 2005 from the estate of Walter Lucas. On November 8th, 2008 Stout Auctions offered the train collection from the Lawrence S. House estate for sale. 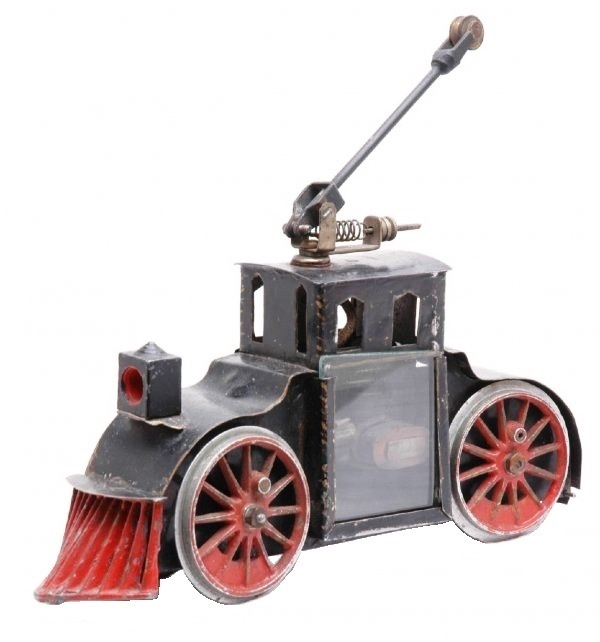 This auction included the Jehu Garlick electric loco from 1895 which sold for $40,000.00. The Garlick 1895 electric loco was purchased by Paul Kovacs at the auction. Kovacs began to produce reproduction locomotives very close in design to the prototype, that could actually be run using overhead catenary power.